HA NOI (VNS) — The national stock market extended its losses yesterday as large-cap stocks performed weakly. The VN-Index decreased 0.5 per cent to close at 562.24 points. Of all stocks, the number of advancing stocks was two-thirds the losers by 81 to 125. A total of 77 others stayed flat. Market trading volume fell slightly to 98.5 million shares worth VND1.65 trillion (US$76.5 million), basically unchanged since Monday. The VN30 Index, tracking the 30 largest codes by market value and liquidity, lost 0.36 per cent to end at 593.67 points. The 30 largest stocks traded 32.4 million shares, worth VND582.5 billion ($26.9 million). In this basket, the number of losing stocks tripled the number of advancing ones by 18 to seven, and five remained flat. All bank stocks declined. The Bank for Investment and Development of Vietnam (BID) and Vietcombank (VCB) in turn had the highest drop with 1.57 and 1.6 per cent. Military Bank (MBB) and Sacombank (STB) continued to decline after their annual shareholders' meetings yesterday. The two stocks dropped 0.73 per cent and 0.56 per cent, respectively. Ocean Group JSC (OGC) was the most active code on the southern market. There were more than 9.1 million of its shares being traded and its price fell 2.27 per cent to VND4,400. Among advancing stocks, Hochiminh City Infrastructure Investment JSC (CII) gained 2.35 per cent to reach VND21,800. FLC Group (FLC) surged by 0.95 per cent to VND10,600. 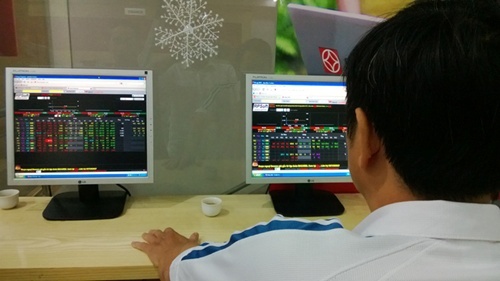 On the Ha Noi Stock Exchange, the HNX-Index fell 0.22 per cent to finish at 83.11 points. Among all stocks, there were 105 losing stocks, 81 advancing stocks and 178 stayed flat. The market's trading volume reached 60 million shares and the market's trading value rose 36 per cent to VND709.7 billion ($32.8 million). The HNX30 Index remained unchanged at 158.35 points. In this basket, the number of advancing stocks was half the number of losing ones, and twelve stocks stayed flat. KLF Joint Venture Global Investment JSC (KLF) was the most active code on the northern market. A total of 18.5 million of its shares were traded for VND9,500 – a remarkable increase of 7.95 per cent.